Media captionGavin Williamson: "We want to drive them out of Iraq and Syria"
The UK will "bring destruction" to those who fight for so-called Islamic State, the defence secretary has said. 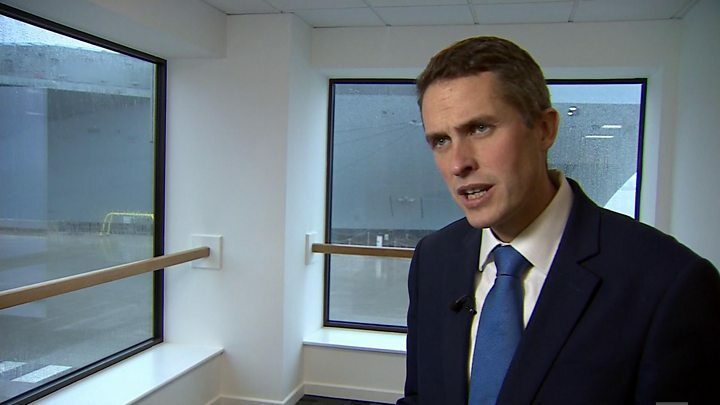 Gavin Williamson said British armed forces were "making sure terrorists have nowhere to hide" across the globe. Speaking at the commissioning of the aircraft carrier HMS Queen Elizabeth in Portsmouth, he said UK forces were driving IS out of Iraq and Syria. He earlier told the Daily Mail: "Quite simply, my view is a dead terrorist can't cause any harm to Britain." Mr Williamson had said no British citizen who has fought for so-called Islamic State should be allowed back into the UK. At least 800 Britons have gone to Syria and Iraq to fight for IS and 130 of those have been killed in conflict. Mr Williamson, who took over as defence secretary last month, said the £3.1bn carrier HMS Queen Elizabeth was "part of our armoury" in dealing with terrorism. "We will be able to deploy her any place in the globe," he said. "We will destroy and bring destruction to these evil death corps such as Daesh and that's what British forces have continuously been doing." He said it was important for the UK to tackle terrorism in "ungoverned spaces" abroad, after forces had spent the last few years driving jihadists from Iraq and Syria. "We've also got to be realistic, as where we have taken territory from them: Where are they going to go? Where are they going to try and strike Britain next?" he said. Speaking to the Mail, Mr Williamson said British fighters who had fled to other countries would be found and stopped from returning to the UK, adding that there would be no "safe space" abroad for them either. "We have got to make sure that as (they) splinter and as they disperse across Iraq and Syria and other areas, we continue to hunt them down," he said. 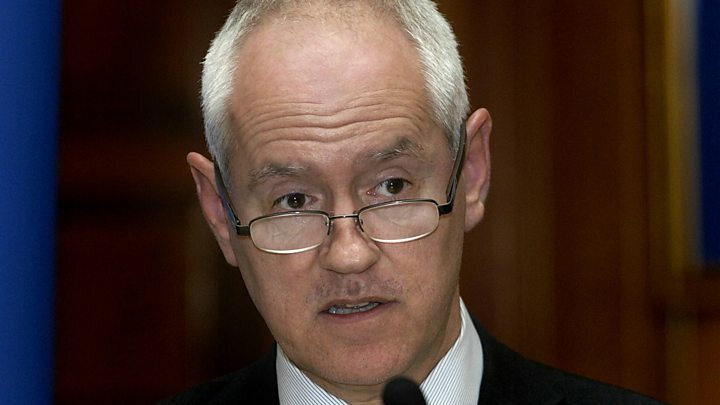 Lord Macdonald, the former director of public prosecutions, said suggesting dead terrorists could not cause any harm to Britain was a "juvenile response". "We can't simply say that everyone who has gone to Iraq will be hunted down and killed," he told BBC Radio 4's The World at One programme. Mr Williamson's predecessor Sir Michael Fallon said in October that British IS fighters in Syria and Iraq had made themselves "a legitimate target" who could end up on "the wrong end of an RAF or USAF missile". And Rory Stewart, the minister for international development, said the "only way" to deal with British IS fighters in Syria is "in almost every case" to kill them. He said they can expect to be killed because of the "serious danger" they pose to the UK's security. Max Hill QC, the Independent Reviewer of Terrorism Legislation, said there should be some allowance for "young and naive" individuals who were "simply brainwashed", for example as teenagers, but insisted that even these people should be prosecuted if they committed serious criminal offences. Analysis: Can the UK legally kill jihadists? Under British and international law, an aspiration to eliminate all known British IS recruits will take a little more consideration than simply launching a drone laden with fire-and-forget missiles. In war, soldiers have immunity from prosecution for killing on the battlefield, unless they have committed a war crime. But the UK is not at war with the IS network - so the same immunity is not automatically available for counter-terrorism purposes. There has to be some other legal basis for justifying the killing. Two years ago, the government sent a three-paragraph letter to the United Nations Security Council setting out the case for killing Cardiff extremist Reyaad Khan. That strike was legal under the "inherent right of self-defence", it said, because the 21-year-old had been directing "imminent armed attacks". MPs have pushed for more information on the decision-making process, that some critics say could amount to an unreviewable secret power to launch "extra-judicial executions." When is it legal to kill your own citizens?